Electrolyte Replacement Tablets - Help to Prevent Muscle Cramps and Heat Prostration due to Excessive Perspiration. 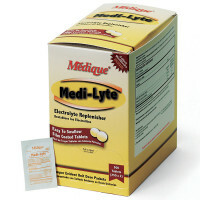 Electrolyte Tablets are available in convenient two packs. When a person sweats, small amounts of electrolytes – the electrically charged minerals sodium, potassium, chloride, and magnesium – are lost from the body along with water. Electrolytes are chemical substances which, when dissolved or lost in sweat, are missing the electrically charged particles or ions. These ions are necessary for cellular metabolism, for intra- and extra-cellular chemical balance, and for assisting in the neuro-metabolic expenditure of caloric energy. Basically, many normal bodily functions are dependent on these substances. As important as the fuel you consume and the water you drink during exercise is a consistent replenishment of electrolytes. Regular body functions, and performance performance, are severely compromised if adequate levels of electrolytes are not present, especially in the heat and/or when physical activity continues over prolonged periods of time. To replenish lost electrolytes, a person ordinarily needs only to eat a regular diet that meets energy and nutrient needs. 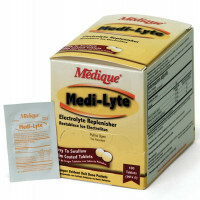 In extreme or demanding activities, electrolyte replacements may be needed. An electrolyte is any substance containing free ions that behaves as an electrically conductive medium. Because they generally consist of ions in solution, electrolytes are also known as ionic solutions, but molten electrolytes and solid electrolytes are also possible. They are sometimes referred to in abbreviated jargon as lytes. Electrolytes commonly exist as solutions of acids, bases or salts. Furthermore, some gases may act as electrolytes under conditions of high temperature or low pressure. Electrolyte solutions can also result from the dissolution of some biological (e.g. DNA, polypeptides) and synthetic polymers (e.g. polystyrene sulfonate), termed polyelectrolytes, which contain multiple charged moieties. In simple terms, the electrolyte is a material that dissolves in water to give a solution that conducts an electric current. All higher lifeforms require a subtle and complex electrolyte balance between the intracellular and extracellular milieu. In particular, the maintenance of precise osmotic gradients of electrolytes is important. Such gradients affect and regulate the hydration of the body, blood pH, and are critical for nerve and muscle function. Various mechanisms have evolved in living species that keep the concentrations of different electrolytes under tight control. Electrolyte balance is maintained by oral, or in emergencies, intravenous (IV) intake of electrolyte-containing substances, and is regulated by hormones, generally with the kidneys flushing out excess levels. In humans, electrolyte homeostasis is regulated by hormones such as anti diuretic hormone, aldosterone and parathyroid hormone. Serious electrolyte disturbances, such as dehydration and overhydration, may lead to cardiac and neurological complications and, unless they are rapidly resolved, will result in a medical emergency. Measurement of electrolytes is a commonly performed diagnostic procedure, performed via blood testing with ion selective electrodes or urinalysis by medical technologists. The interpretation of these values is somewhat meaningless without analysis of the clinical history and is often impossible without parallel measurement of renal function. Electrolytes measured most often are sodium and potassium. Chloride levels are rarely measured except for arterial blood gas interpretation since they are inherently linked to sodium levels. One important test conducted on urine is the specific gravity test to determine the occurrence of electrolyte imbalance. Electrolytes are commonly found in sports drinks. In oral rehydration therapy, electrolyte drinks containing sodium and potassium salts replenish the body's water and electrolyte levels after dehydration caused by exercise, diaphoresis, diarrhea, vomiting or starvation. These drinks are, however, only necessary after truly Herculean efforts, such as marathons and biathlons, have been performed. People exercising in a normal way (for example cycling for one hour) can also drink pure water. Because sports drinks typically contain very high levels of sugar, they are not recommended for regular use by children. Water is considered the only essential beverage for children during exercise. Sports drinks are also not appropriate for replacing the fluid lost during diarrhea. Medicinal rehydration sachets and drinks are available to replace the key electrolyte ions lost. Dentists recommend that regular consumers of sports drinks observe precautions against tooth decay. When electrodes are placed in an electrolyte and a voltage is applied, the electrolyte will conduct electricity. Lone electrons normally cannot pass through the electrolyte; instead, a chemical reaction occurs at the cathode consuming electrons from the cathode, and another reaction occurs at the anode producing electrons to be taken up by the anode. As a result, a negative charge cloud develops in the electrolyte around the cathode, and a positive charge develops around the anode. The ions in the electrolyte move to neutralize these charges so that the reactions can continue and the electrons can keep flowing. and oxygen gas will be liberated. The positively charged sodium ions Na+ will move towards the cathode neutralizing the negative charge of OH− there, and the negatively charged chlorine ions Cl− will move towards the anode neutralizing the positive charge of H+ there. Without the ions from the electrolyte, the charges around the electrode would slow down continued electron flow; diffusion of H+ and OH− through water to the other electrode takes longer than movement of the much more prevalent salt ions. Electrolytic conductors are used in electronic devices where the chemical reaction at a metal/electrolyte interface yields useful effects. In batteries, two metals with different electron affinities are used as electrodes; electrons flow from one electrode to the other outside of the battery, while inside the battery the circuit is closed by the electrolyte's ions. Here the electrode reactions slowly use up the chemical energy stored in the electrolyte.